Installation is easy. 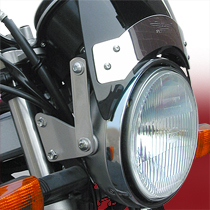 Available in fork-mount or headlight-mount styles depending on application. 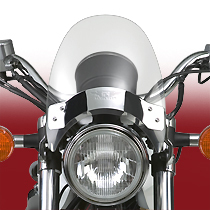 The Flyscreen® is a small windshield that will really enhance the front end of your cruiser, standard bike, or custom creation. 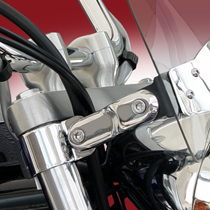 The clean appearance is accented with your choice of chrome or black front trim plate. 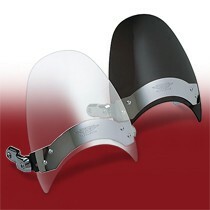 For that dark custom look, get the Flyscreen in Dark Tint. 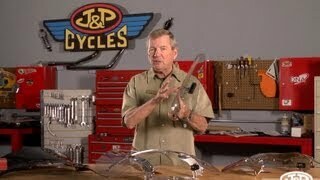 The tint is dark enough to hide cables while letting just a little bit of chrome shine through. The Dark Tint Flyscreen is made from FMR hardcoated polycarbonate and is covered by our 3-Year Warranty against breakage. The Flyscreen has a chromed or black painted steel front plate with machined steel Linking Arm™ Mounting System in matching finish. All mounting hardware is included.